Note: Some of the letters are addressed to Mr Subhi Al-Shaik, as he was the first signatory listed (signatories were listed by alphabetical order of organisation). 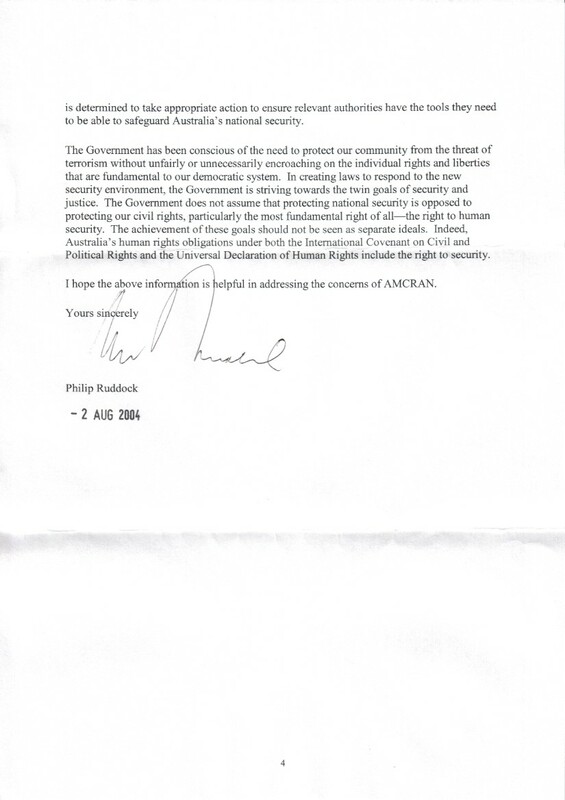 I refer to your letter dated 2 August 2004 in response to our open letter to all federal ministers of parliament on 9 June 2004. I thank you for your detailed and long-awaited response. 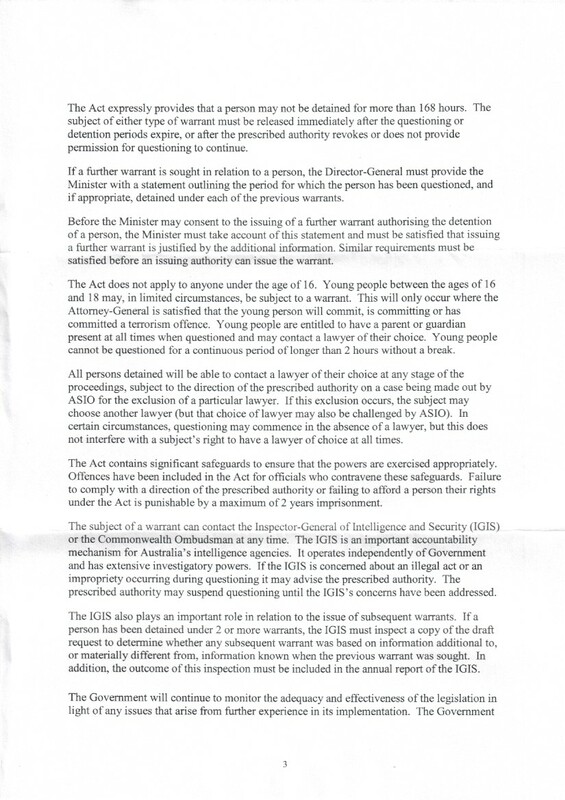 We are all too aware of the details of anti-terrorism laws in this country that you have painstakingly outlined in your letter, as we have recently released a know-your-rights guide that outlines people’s rights and responsibilities under these laws, a copy of which we have forwarded to you previously. However, we are not convinced that your response adequately deals with our concerns as raised in our original correspondence. Your statement may be correct, but it is not complete. While it is arguable that organisations on the current list are “terrorist” organisations, there are other organisations that are considered by many other governments to be terrorist that are not on the proscribed list. We refer you to the report produced by the Parliamentary library , which finds the process of proscribing terrorist organisations under Australian law to be largely subjective. It poses the question why organisations such as the Shining Path, the Tamil Tigers, Real IRA and Kahane Chai are not listed as terrorist organisations, while Palestinian Islamic Jihad is. We contend that your department is not applying a level playing field, as it is not applying the same criteria to Muslim organisations as it is to non-Muslim organisations. We specifically ask for clarification as to why the four organisations mentioned above are not listed as terrorist organisations while Palestinian Islamic Jihad is. You stated that “it is appropriate to treat suspected terrorists in the same way that we currently treat suspected murderers”. 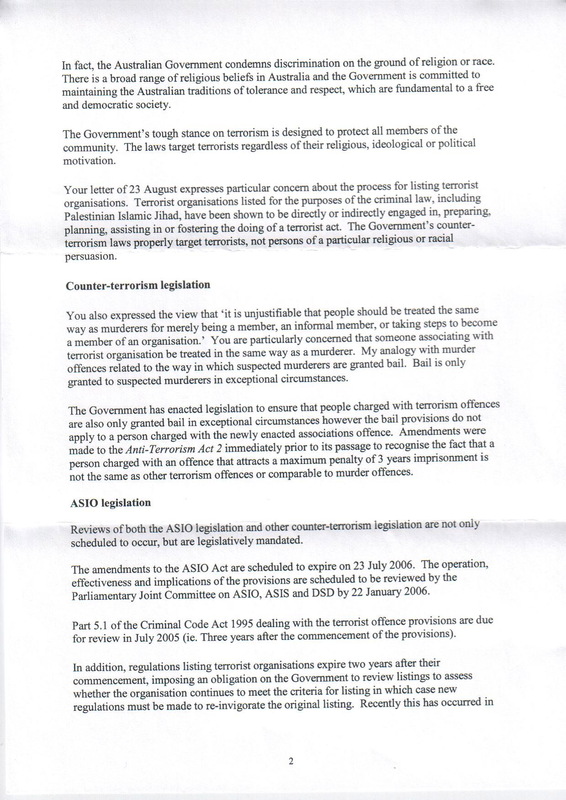 We do not disagree that terrorists should be treated in the same way as murderers, but the problem lies in the breadth of the definition of a ‘terrorist’ and possible terrorist offences under Australian anti-terrorism legislation. It is unjustifiable that people should be treated the same way as murderers for merely being a member, an informal member, or taking steps to become a member, of an organisation. With the introduction of the new offence of associating with terrorist organisations, why should a person who does nothing more than speak to someone twice be treated in the same way as a murderer? We seek clarification as to why you insist on conflating many different offences, ranging in punishment from 3 years to life, with the offence of murder punishable by imprisonment for life. It is not evident what measures have been put in place to monitor the adequacy and effectiveness of the anti-terrorism laws. We are yet to see the outcome of any review or monitoring of the laws. We believe that the issues we raised in our original correspondence, as well as the undeniable infringement of human and civil rights warrant investigation and review of the laws, yet the Government has made no such commitment. 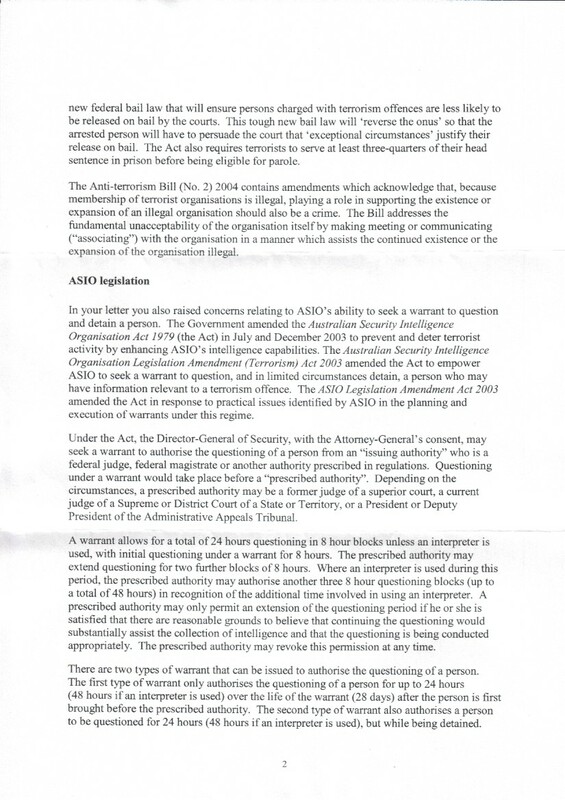 We request clarification about what specific mechanisms the Government has put in place to monitor the adequacy and effectiveness of the legislation, particularly from the perspectives of individuals questioned under this legislation, and what reporting obligations you intend to place on ASIO to ensure the protection of Australian citizens’ rights. We do not disagree that every person has the right to security, and that the Government has a role to play in protecting national security. However, the International Covenant on Civil and Political Rights and the Universal Declaration of Human Rights also guarantee other rights, such as the right to liberty, equality before the law without distinction of any kind, including race, colour, religion, or political opinion, the right to freedom of movement, the right to leave and to return to his country, and the right to freedom of peaceful assembly and association. In addition, no one shall be subjected to arbitrary arrest or detention, and no one shall be subjected to arbitrary interference with his privacy, family, home or correspondence, nor to attacks upon his honour and reputation. Anti-terrorism laws in this country do not have regard to these other equally legitimate and important rights. The twin goals of security and justice should not be seen as separate ideals, but we do not believe that the Government has struck an appropriate balance. It seems that the Government is only too keen to implement laws that give ASIO and the police more power than necessary, yet there has not been any move towards protecting the other civil rights of all citizens. It is particularly worrying that the Government hides behind its rhetoric of safeguarding Australia’s national security while disregarding the real effect that these laws and their application have had on the community. 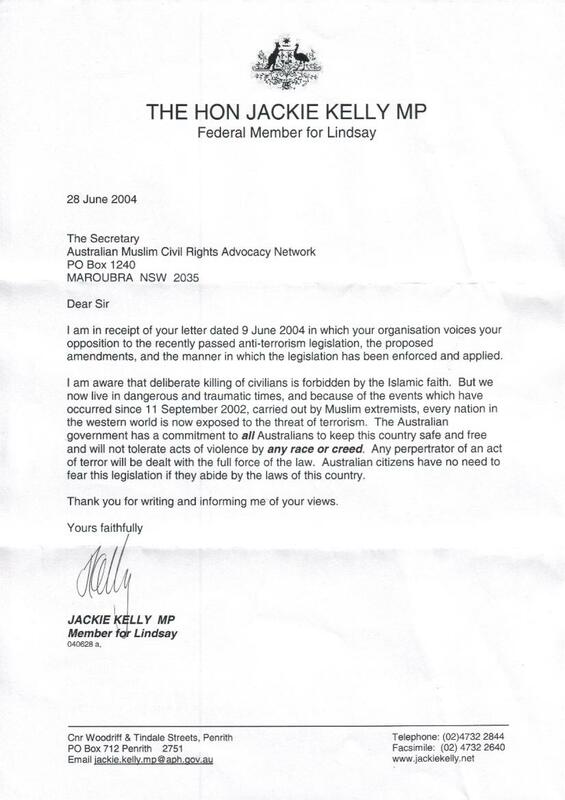 The report on page 67 states that “Several consultation participants felt the Muslim community in Australia had been unfairly targeted in investigations by ASIO officers and Australian Federal Police officers following the Bali bombings in October 2002.” The report also documents concern about the treatment of Muslims in counter terrorist investigations. In addition the report documents that “some consultation participants believed their human rights were at risk of violation under these new laws”. 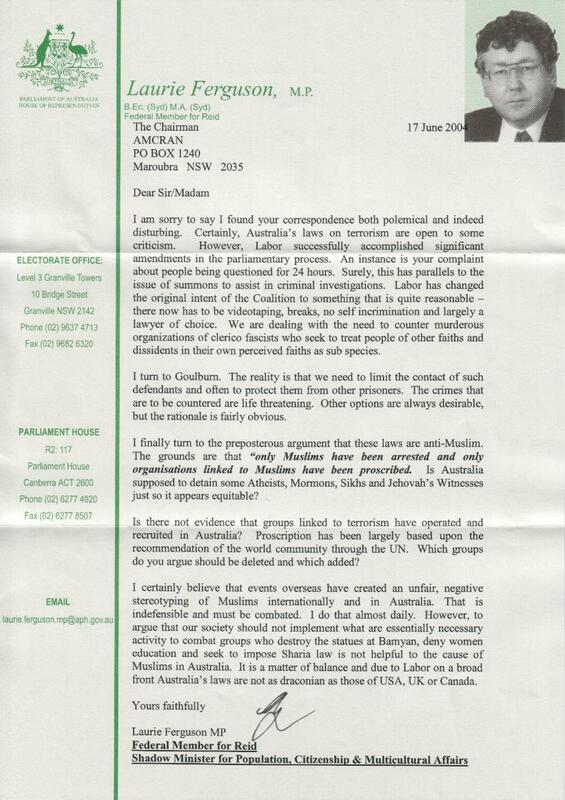 During consultation with nine young people in Adelaide, four of the participants reported being questioned by ASIO in their homes following the wake of the January 2002 national security public campaign and believed this was done solely on the basis that they are Muslim. The report also documented participants’ concerns of surveillance by neighbours and colleagues following the federal government’s national security campaign launched in early 2003, where neighbours reported routine domestic activities and family gatherings. Initial consultation with key community groups reveals that there are heightened concerns that these kinds of incidence will continue with the current anti-terrorism provisions. Dr William Jonas, acting race discrimination Commissioner stated in the report: “The need for action is urgent. In the current environment of fear and suspicion fostered by terrorism and the ‘war on terror’, our multicultural values of social equity and respect for diversity are at risk of diminishing”. 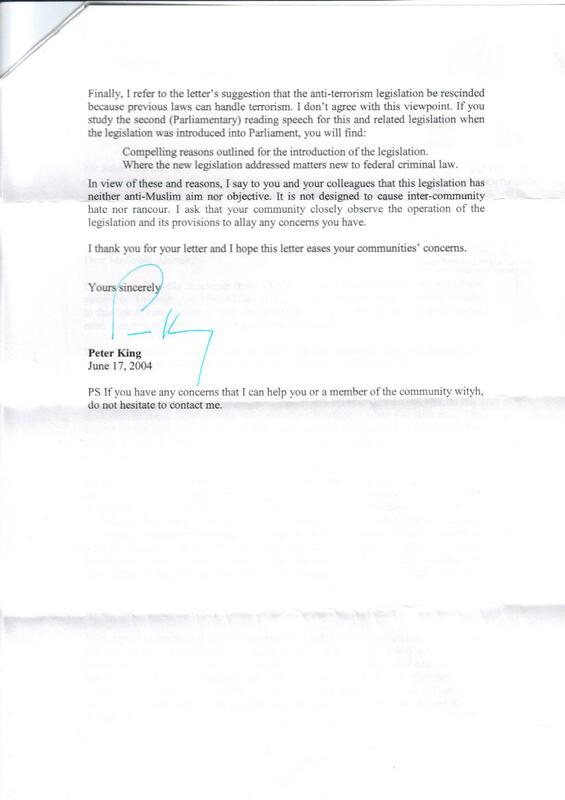 There is little doubt that the additional legislation has served to ostracise the Muslim community even further. 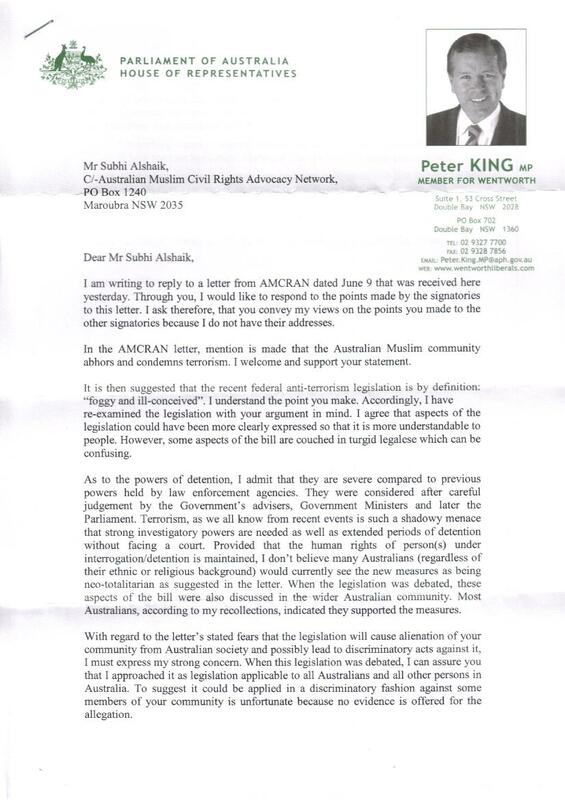 This is not to mention ASIO’s behaviour, which, as indicated above, has created tension between the Muslim community and ASIO. We submit that this legislation – and particularly the recent Anti-Terrorism Bill (No 2) with its association offence – has made cooperation with authorities even harder for Muslims. 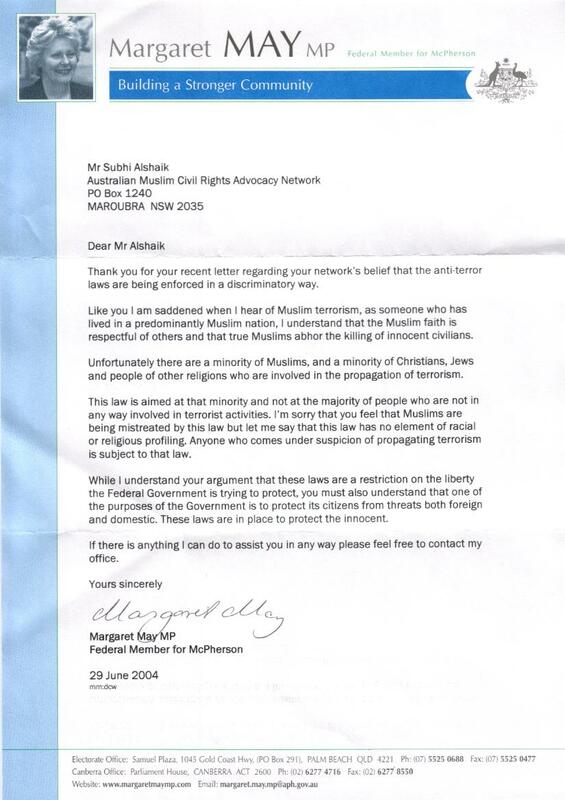 Yet, according to your Department’s proscribed terrorist list, only Muslim terrorist organisations are a threat to Australia. We seek specific clarification as to how damaging relations with the ethnic group that you (somewhat dubiously) suspect is most likely to have information on terrorism related activities serves Australians’ national security. 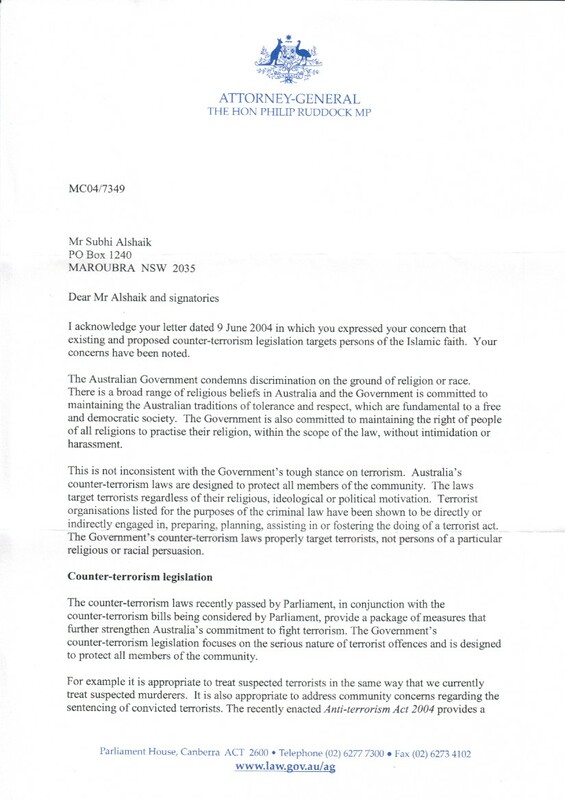 In addition, your assertion that “the Australian Government condemns discrimination on the ground of religion or race” seems untenable in light of the fact that the federal Racial Discrimination Act does not prohibit discrimination or vilification on the ground of religion, but only the grounds of race, colour, descent, and national or ethnic origin. This is significant in that it leaves an aperture in the national system of protection against discrimination on the basis of religion. The Muslim community is especially vulnerable in this context as it is comprised of heterogeneous membership, spanning various ethnic and racial backgrounds. Muslims who experience religious discrimination (but not necessarily hostility based on nationality or race) cannot avail themselves of existing anti-discrimination mechanisms. This situation is distinct, by way of example, from that of Australia’s Jewish population who can seek recourse to the Racial Discrimination Act on the basis of belonging to the Jewish race. 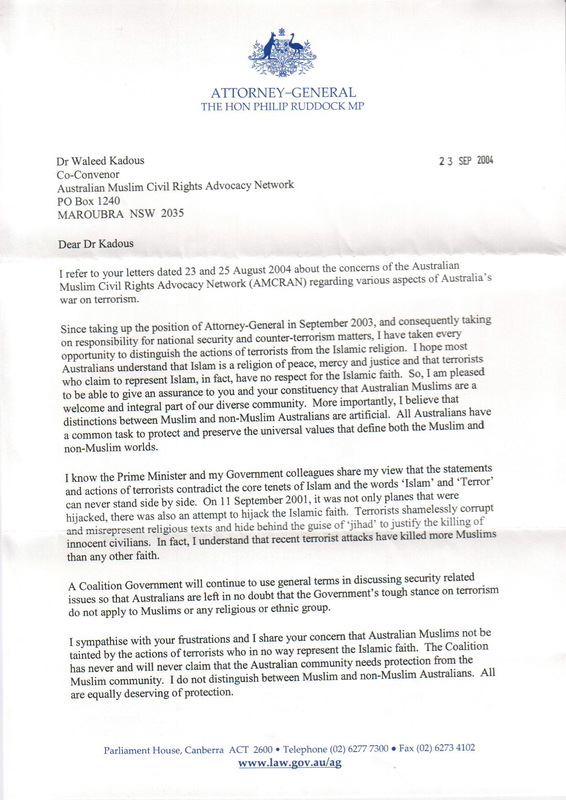 The absence of federal religious vilification laws becomes even more pertinent in light of extensive reports of discrimination and vilification against the Muslim community, as documented is the Isma report discussed above, which found that the majority of respondents had experienced some form of harassment and prejudice because of their religion. 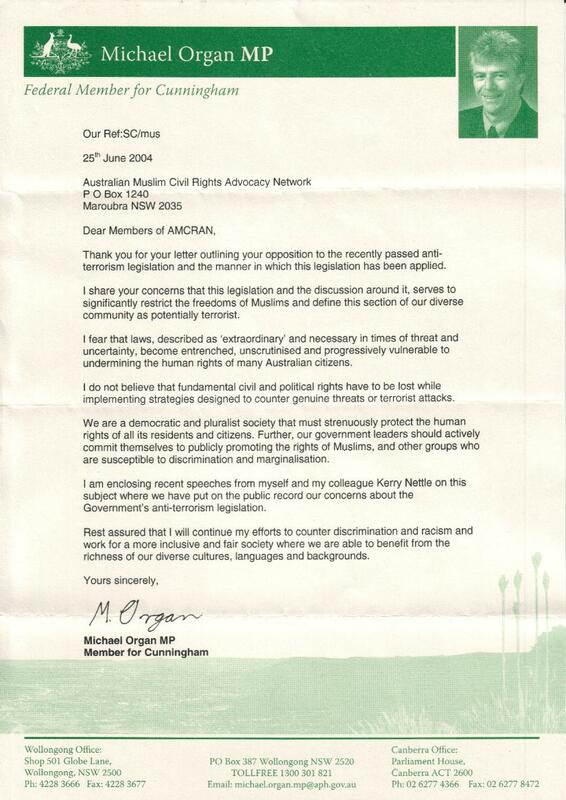 Given the Commission’s findings of widespread discrimination and vilification on the Muslim community, it is submitted that Australia’s failure to enact federal laws to prohibit discrimination and vilification on the ground of religion is a direct contravention of Article 20 of the ICCPR. We seek specific clarification as to how you plan to address this gap in the legislation. We urge you to give due consideration to the issues we have raised above. We look forward to your speedy response to our specific requests for clarification. 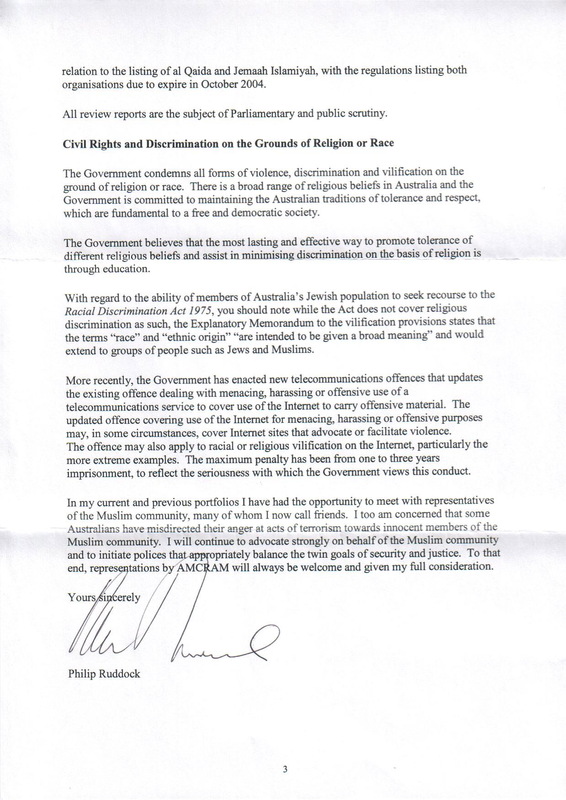 Mr Ruddock's response is as follows: Page 1, Page 2 and Page 3.